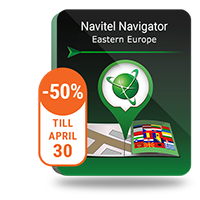 Russia, Belarus and Kazakhstan Q3 2018 maps are now available to the users of Navitel Navigator. Q3 2018 updated map contains 161 255 towns and settlements, including 19 521 settlements with address search support and street network. The updated map includes 1 301 299 Points of Interest. The road graph is 3 921 357 km. 9 871 152 unique addresses are available for search. The latest map of R256 highway was updated with up-to-date speed limits, crosswalks, speed cameras. Address database and road network were updated in the cities of Achinsk, Irkutsk, Kemerovo, Kostroma, Krasnoyarsk, Tomsk, Vladivostok, and Metallploshchadka village (Kemerovsky District). The street-level search has been updated for Novgorod Oblast, Tver Oblast, Zabaikalsky Krai. In Krasnodar Krai the following towns and settlements have been added to the map with street-level search available from Q3 2018 – Chigrina, Korzhevsky, Krizhanovsky, Tikhovsky, and Turkovsky. New POIs have been added. The map of Belarus contains 27 410 cities and settlements, of which 25 212 include address search. The total of 2 050 241 unique addresses are available for search. The map contains 67 557 POI. Total length of the road graph is 288 349 km. The road network and address database were updated and detailed. New POIs have been added. The map of Kazakhstan contains 9 776 cities and settlements, of which 296 include address search. The total of 344 826 unique addresses are available for search. The map contains 22 341 POI. Total length of the road graph is 1 262 360 km. Address database and road network were updated in the city Almaty and in Almaty Region. Lane guidance information was also revised and updated. Road network and administrative data have been updated in Turkistan region (new administrative division previously known as South Kazakhstan Region). In the city of Atyrau, street and road network were updated, and its residential suburb detailed to the street-level.